Item 1: Dad's hiking exploits are often mentioned in a weekly column written by one of his hiking buddies, Ed Parsons, in the Conway Daily Sun. Ed's March 9th article features dad's quest to summit the 100 highest peaks in New England (a feat that only 502 other people have achieved). Click here to read the article online at MountWashingtonValley.com (scroll down to the 3/9/02 article). Item 3: Now, here's my online surprise for Larry. Recently, while listening to a boring conference call, I did Google searches on several of my friends' names. Larry was one of them (sorry, folks, none of the others had nearly as interesting the result ...). 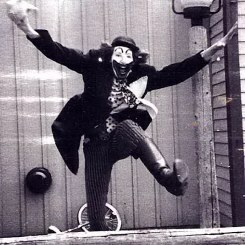 As background, Larry has been telling me for years that he was a clown when he was a teenager at an amusement park near his house called Pleasure Island. "Yeah, yeah," I've always thought, "I'll bet you really schlepped french fries at a food stand, or something ..."
Well, guess what? He was and there's proof. 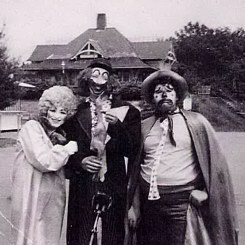 Click here to visit the extensive Pleasure Island history and memorabilia web site. If you poke around a while, you'll discover two pictures of Larry. Or just click on the pictures and you'll reach the pages directly. Cool, huh? Don't you just love the Internet? I'm in Scottsdale Arizona for a meeting. It snowed here today and all the rocky hill peaks nearby are covered with snow (sorry, no camera). Amazing. I didn't even wear a jacket because I figured it'd be warm like it always is. So much for global warming, although it sure seems like something funky is going on based on the winter we've had in New England this winter (it was 62 degrees on Wednesday). The big news (other than Ziggy's imminent arrival and the Patriots being in the Super Bowl this weekend -- both of which are really big) is that Lynne, Cooper and I rented a house for a week in Virgin Gorda, BVI, with the Bell family. We had a fantastic, superbly relaxing week. Pool, beach, eat, sleep. Check out the Villa on the Beach pics on this page. 6:56 pm pre-publish update: I'm sitting at the counter in Maine. Cooper has been playing with magnetic letters on the refrigerator -- bringing them over one at a time to ask "what's that?" He has recently been playing with letters at home, also, and knows a few of them and words that go with them. A little while ago, he brought over a 'c' and for the past 15 minutes has been going around the house saying "Cooper" (well, Coo-paa, actually), pointing at his pictures and saying his name and correctly answering our question, "what's your name?" A little thing, I suppose, but so cool. Can toilet training be far behind? Cooper is growing up really fast. In fact, at his 18-month check-up last week, they said that he's grown 4-1/2" in the past 3 months! Check out the Cooperman! page for the latest photos and a video clip from his recent visit to Grammie and Grampa's home in the Florida Keys . The biggest news around our house is that Lynne and I are expecting another baby in late February. Both Lynne and the baby are doing great, health-wise, and the baby (belly code-name: "Ziggy") is incredibly active. Cooper seems aware of the baby ... as much as I suppose he can be. He has just started being able to answer Lynne's question, "what is in Mama's belly?" with a reply of "baby Ziggy!" -- which is very cute -- and has even tried to share toys and food with Ziggy by putting them up against Lynne's stomach. Our friends, Ed and Didi, met Stanley last weekend. Stanley Cup, that is. At the end of the day, Cooper was so sweaty and dirty that Annemarie invited Cooper to take a bath with Caroline. They had a blast and Cooper demonstrated the joy of splashing to Caroline. 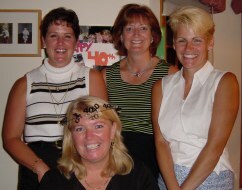 Things got so raucous that Annemarie and Lynne had to hold a towel at the side of the tub. I feel like I've just entered the confessional: "Bless me father, for I have sinned, it has been 10 months since I last updated my web site." Phew, it always feels better afterwards. OK, friends and family, I'm going to try to get back to updating Goofster every month, or more. There's so much cool stuff going on to share. And while I haven't missed the work of updating the site, I have missed the chance to connect with you through the things we do together ... and I'm tired of getting (appropriately) slapped for not sharing Cooper pictures with you all. So here goes ... a bit of catch-up now, and timely stuff from now on (he said, with all good intent). First, visit the all new Cooperman! page by clicking on his picture (from Cooper's first baseball game at the Portland Seadogs), or the link up above. There are links to a photo album, some video clips and Cooper's "First Christmas" photo album web site. Second, you'll notice another new page called Sutterfly albums. I'll be posting links to some of our digital picture albums there -- rather than publish them all here, too, which is a hassle. That way, you get to see more pictures, quickly, because they have a cool slide show feature. AND, you can order your own prints, if you'd like. 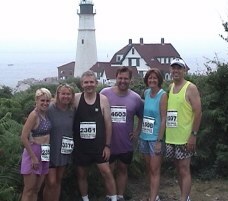 Lynne and I ran in the Beach to Beacon 10K road race on August 4th with our friends Sherry Libby, Loraine & Alain Cotnoir and Harry McNabb. It was a beautiful course, with fans along the road the whole way. Over 3,700 people finished, including every one of us. Sorry, no pictures, yet, because we're waiting for our official photographer, Larry Bugden, to send them to us (fellow racers, send Larry an email to bug him). Sherry and Lynne have run in several races together this year. Check out some of their pictures on the Shutterfly page. I hiked in the Bob Marshall Wilderness in Montana for a week in July on another Smelly and Dangerous expedition. This is a picture of our team (missing one, Mike Schmidt, who was in radio contact about 1/2 mile back) atop Bungalow Mountain ... our longest single day hike. It was wonderful week with a great group of guys. The eating, in traditional Smelly style, was fabulous. And we suffered no bear attacks ... just a pathetic deer that ate Ed Groark's toothbrush. A web site of the Smelly Montana journey is coming soon. Meanwhile, you can check out a few pictures (just no accompanying descriptions) via a link on the Shutterfly albums page. 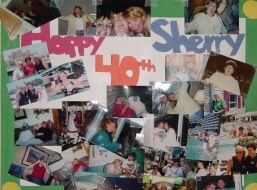 Last Friday, we celebrated Sherry's 40th birthday with a surprise party at our house. She was surprised and it was a very nice evening with family and friends (I met her parents for the first time). Most of her gifts were tasteful.